51) This statue of Cubs broadcaster Jack Brickhouse is a lot more lonely ever since the giant Marilyn Monroe statue arrived to steal all the attention. 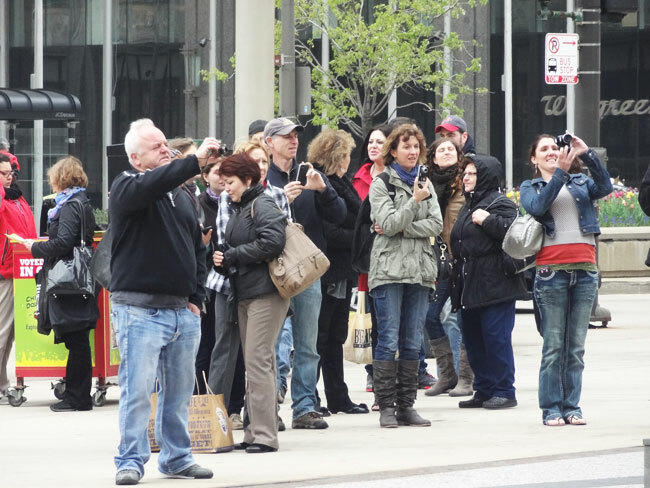 52) The tourists have to get their shot of Marilyn! 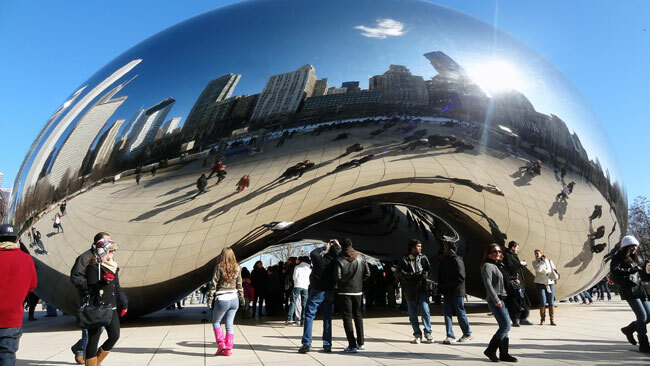 53) She towers over Michigan Avenue. 54) Everyone loves to get a picture taken with the Marilyn Monroe statue, but this girl wins the prize for the cutest pose. 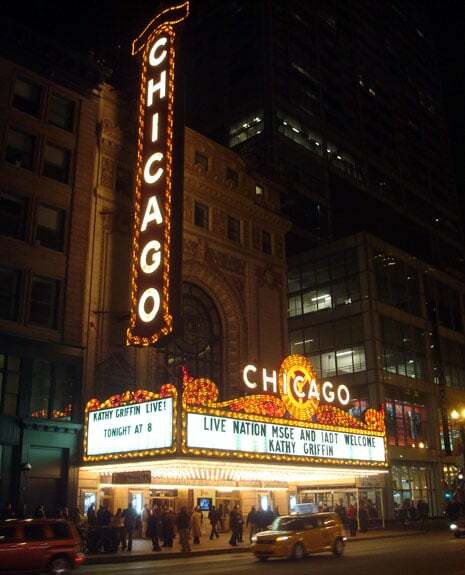 55) The iconic Chicago Theatre. 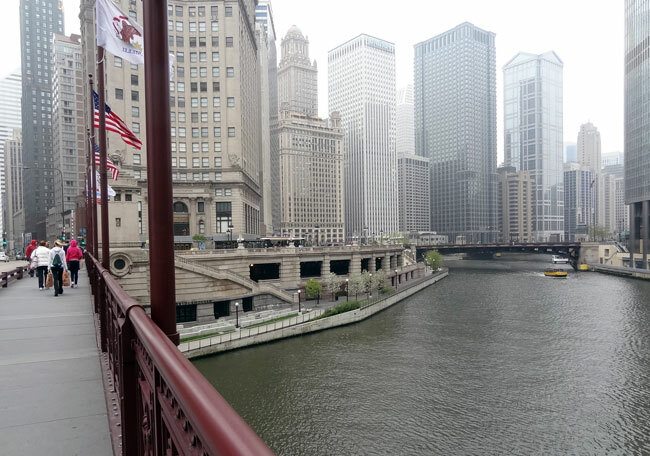 56) Walking across the Chicago River. 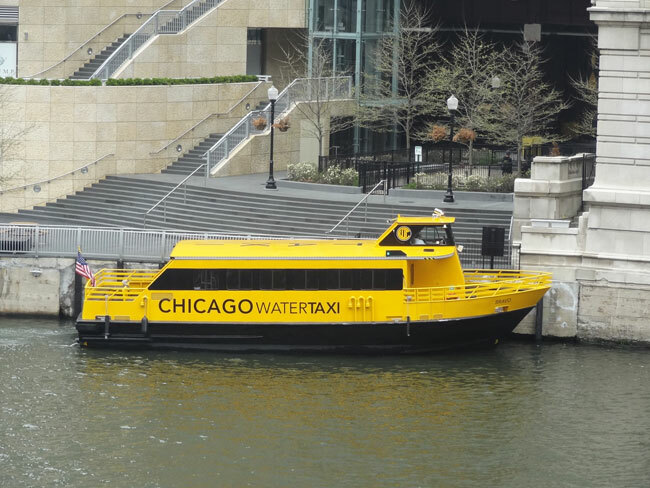 57) I love the concept of the water taxi. 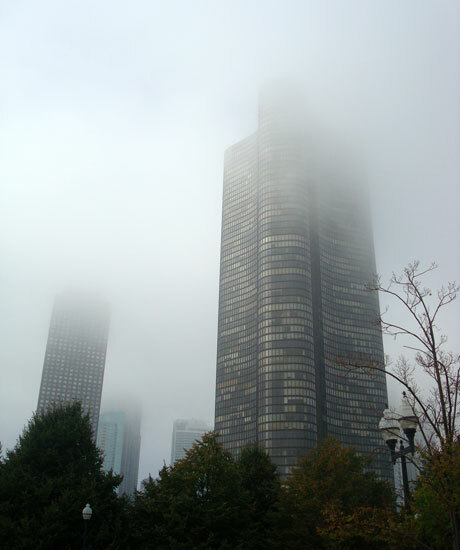 58) The skyscrapers look regal shrouded in fog. 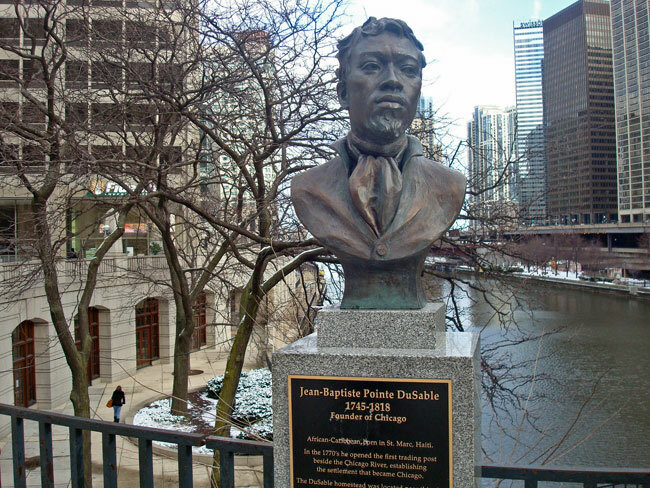 59) A statue of Jean Baptiste Point du Sable, regarded as the first permanent resident and “founder” of Chicago. 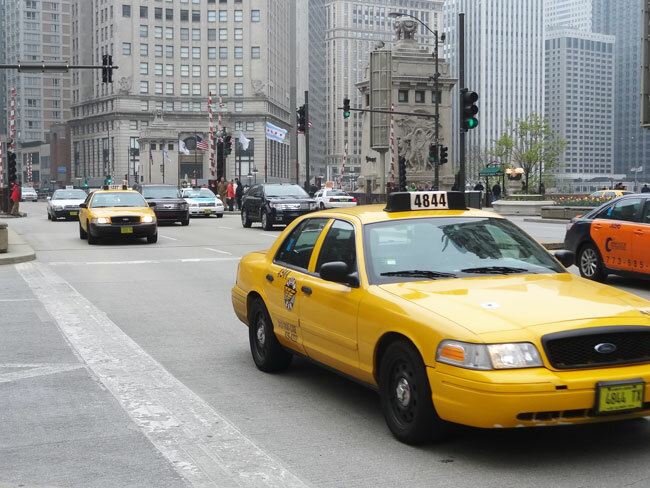 60) It’s no problem finding a taxi downtown. 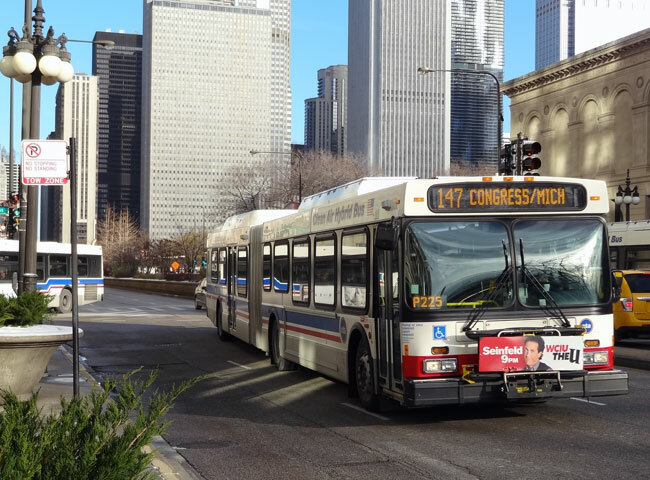 61) And there’s always the CTA buses. 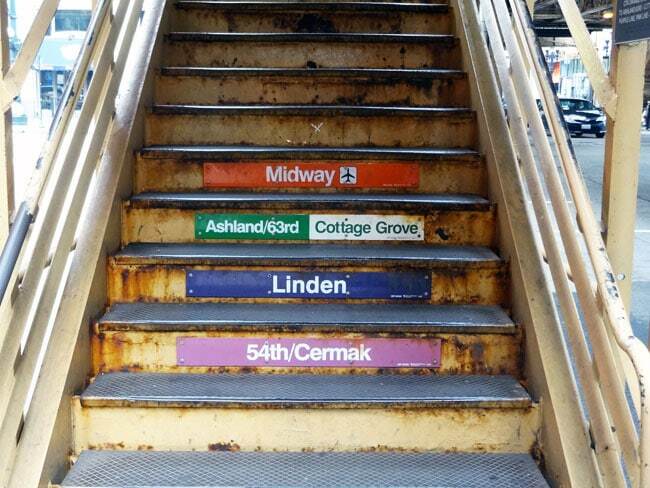 62) Or the L trains. 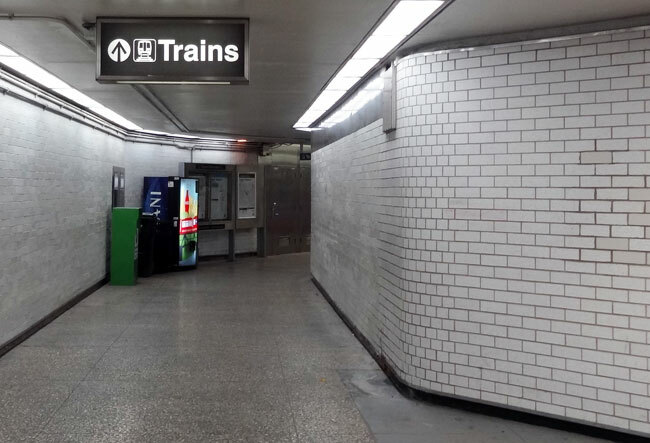 63) Walking down to the station. 64) These steps are both gritty and pretty. 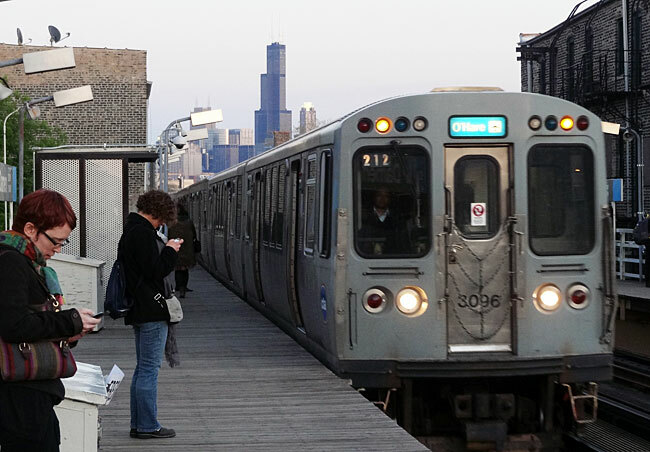 65) The train arrives in Wicker Park with the Willis Tower in the background. 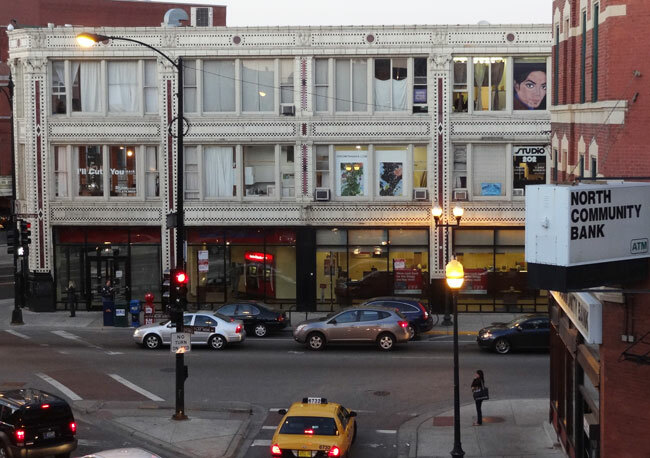 66) A view of the Flatiron Building in Wicker Park. 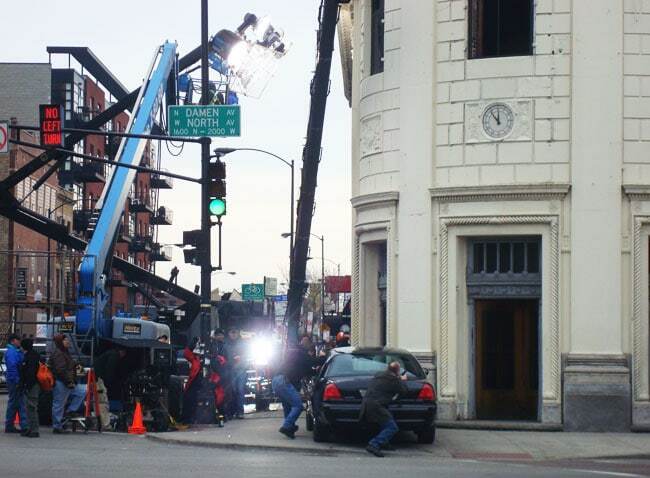 67) You may stumble upon a movie or tv show filming in Chicago. The Transformers filming downtown was pretty sweet to witness. 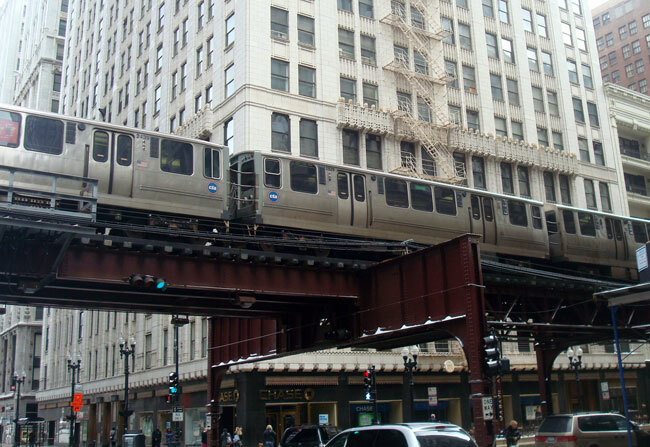 Here, some cop show films at Six Points in Wicker Park. 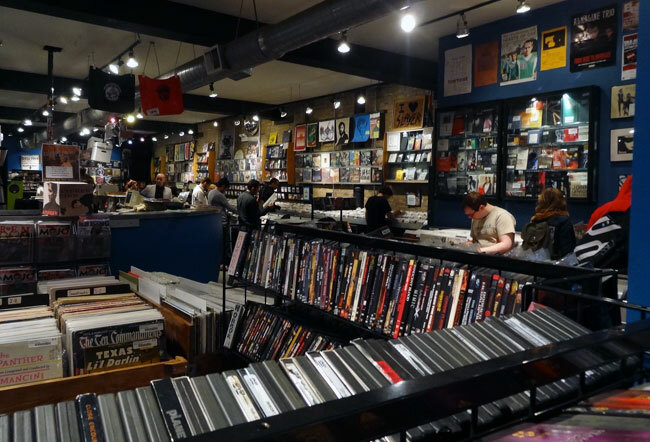 68) Chicago still has a decent number of independent record stores. 69) The bikes are everywhere in the city. 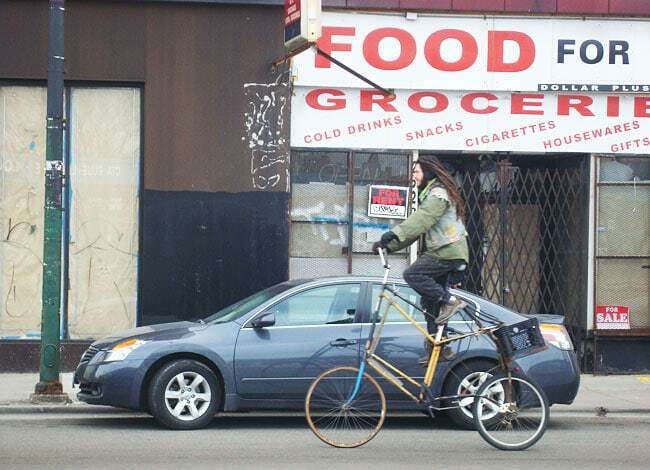 Sometimes you can even find those weird modified bikes. 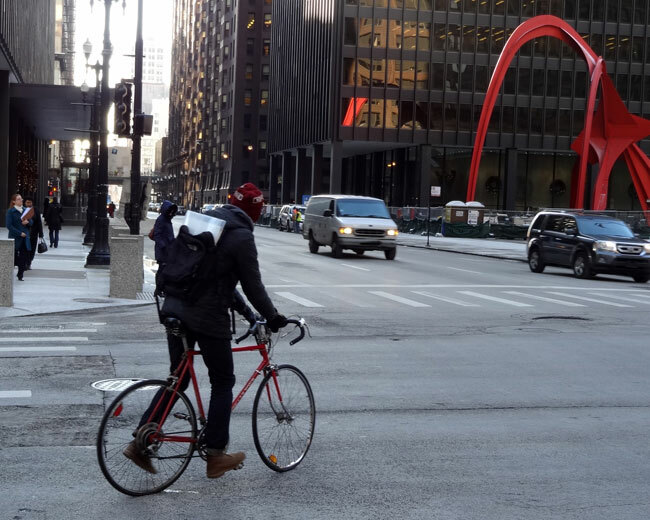 70) Downtown is the one part of the city where I’m wary of biking around. 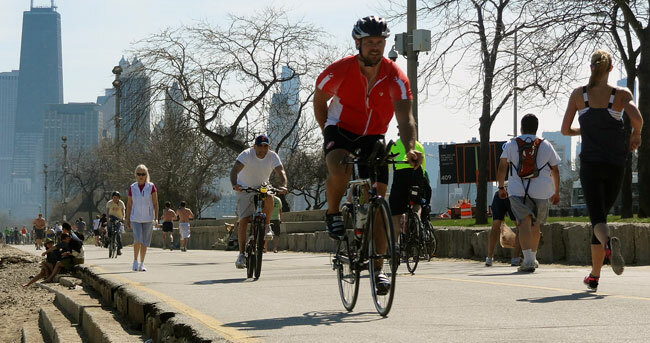 71) I’d much rather bike along the lake on the trail. 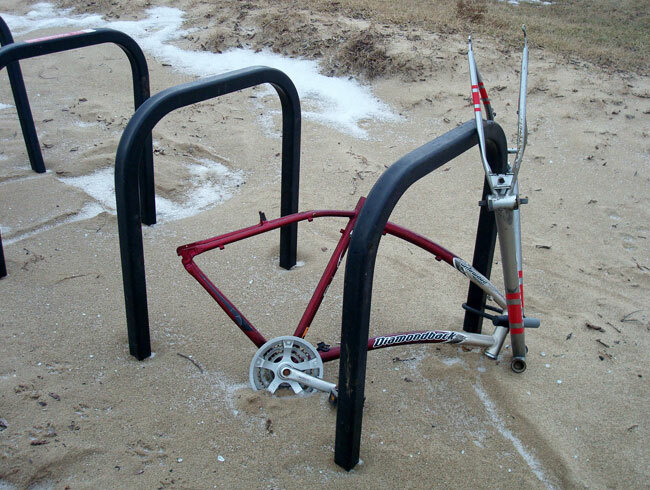 72) It’s funny seeing bike corpses all over the place. 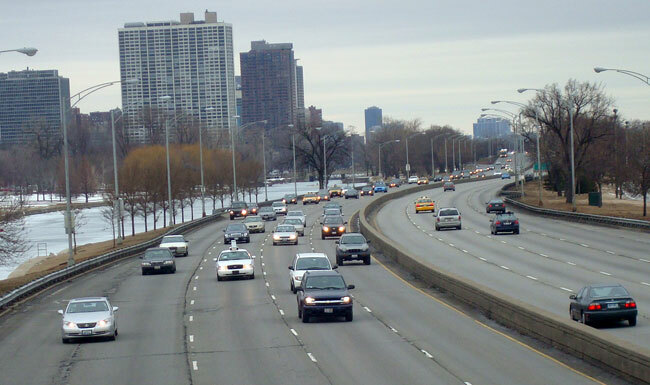 73) Lakeshore Drive is rarely this empty. Pity the poor saps who have to commute everyday on this road. 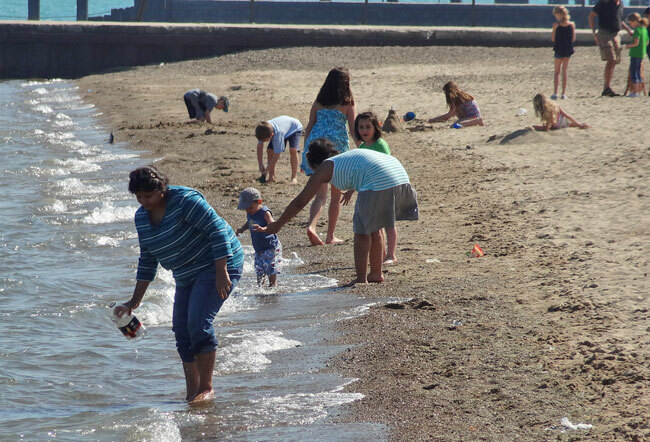 74) It doesn’t get much better than summer on the lake in Chicago. 75) Especially for the kids. 76) Meanwhile, winter is more ideal for kids who want to try ice skating. 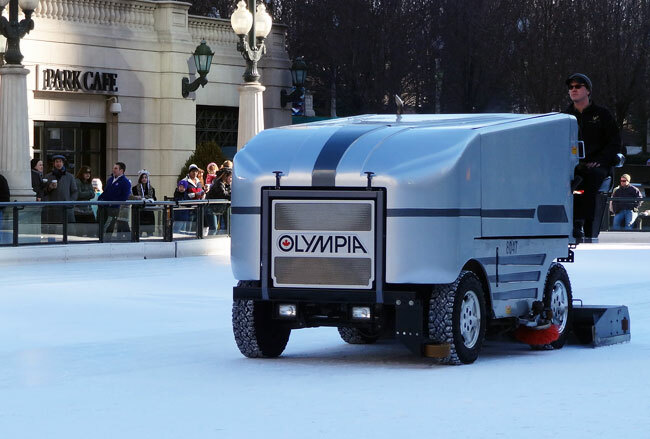 77) Look out for that Zamboni man! 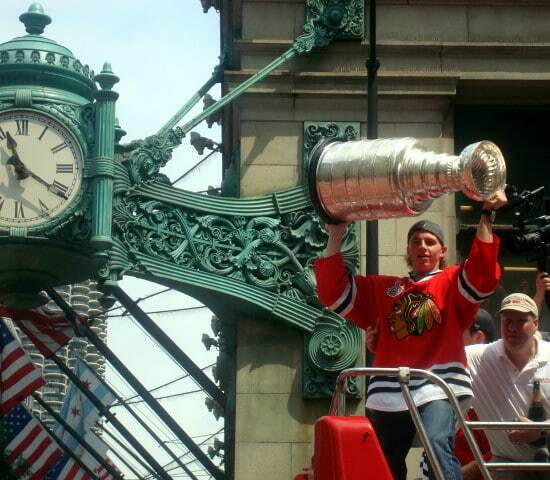 78) While we’re on the subject of skating, remember when the Blackhawks won the Stanley Cup? 79) Ditka! 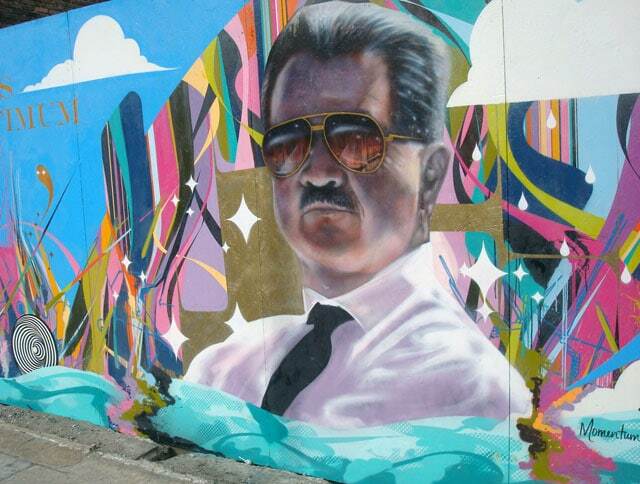 The mural honors his greatness. 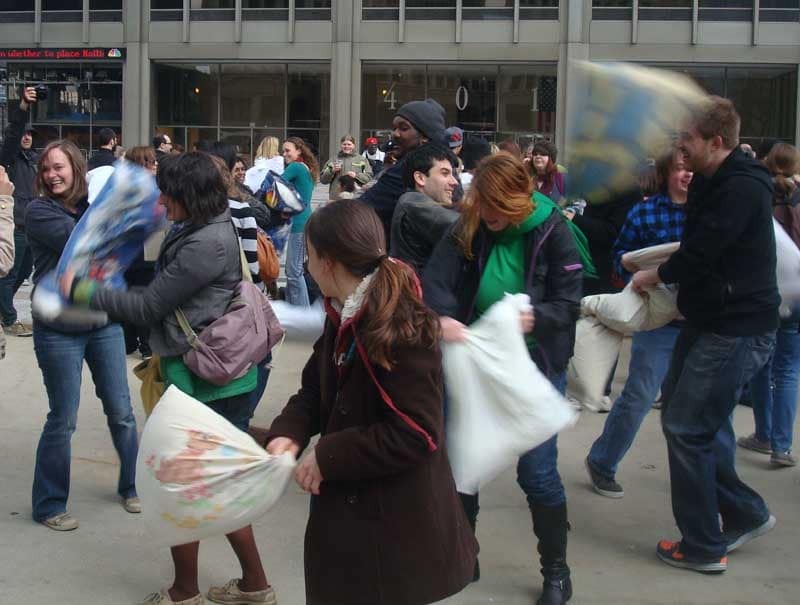 80) World Pillow Fight Day brings people of all backgrounds together to beat the crap out of each other. 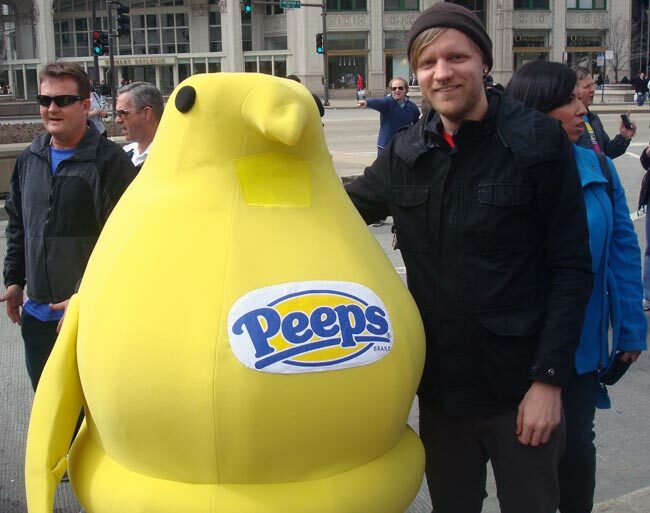 81) At last year’s World Pillow Fight Day, I got to hang with the Peep. 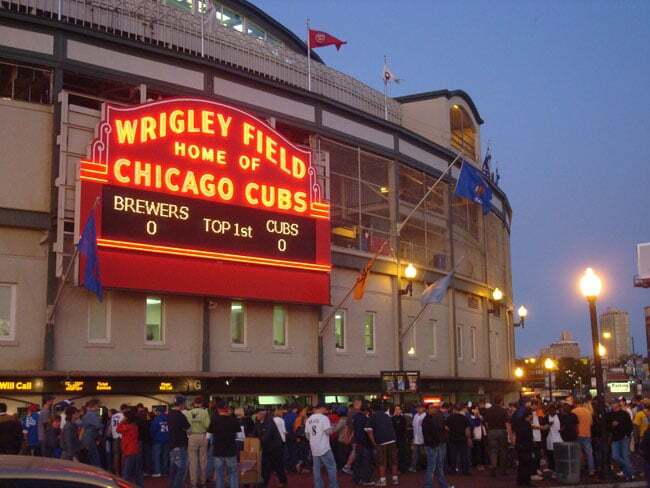 82) When it comes to atmosphere, there’s no place like Wrigley Field. 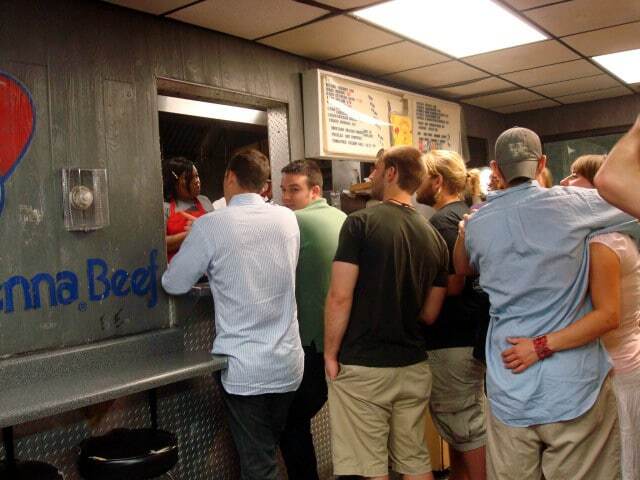 83) You can buy a hot dog at the game, or head over to the Wiener Circle to get yelled at as you order. 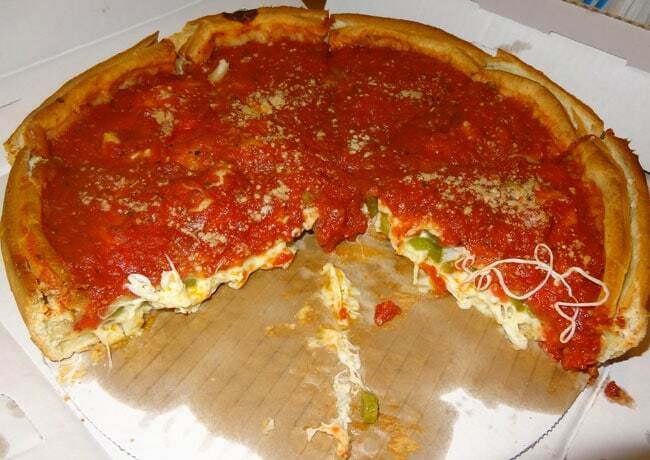 84) It’s hard to believe I had never had real deep dish before moving to Chicago, because now I can’t get enough. 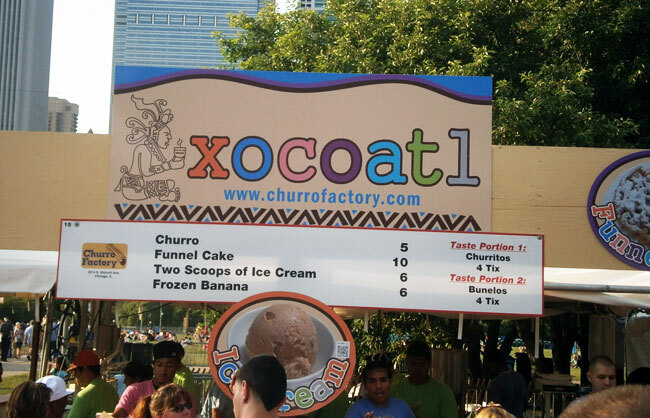 85) The Taste of Chicago festival is always a great place to try new foods, although the prices are pretty expensive. I usually can’t justify buying anything more than the sample portion. 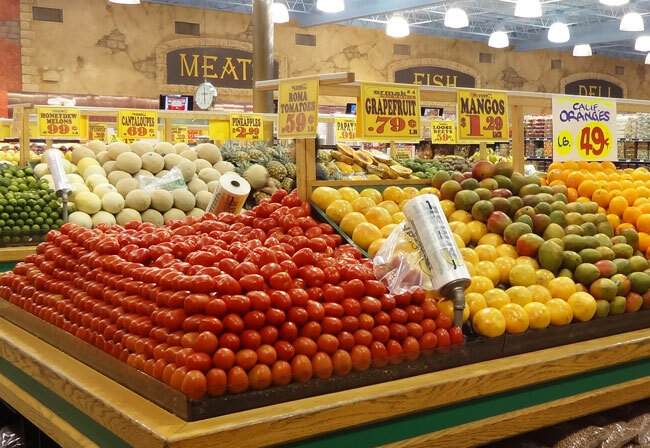 86) The Mexican groceries on the west side are amazing. Dirt-cheap produce! 87) This pic probably seems meaningless, unless, like me, you’re from Pennsylvania, where booze can only be sold in state stores. 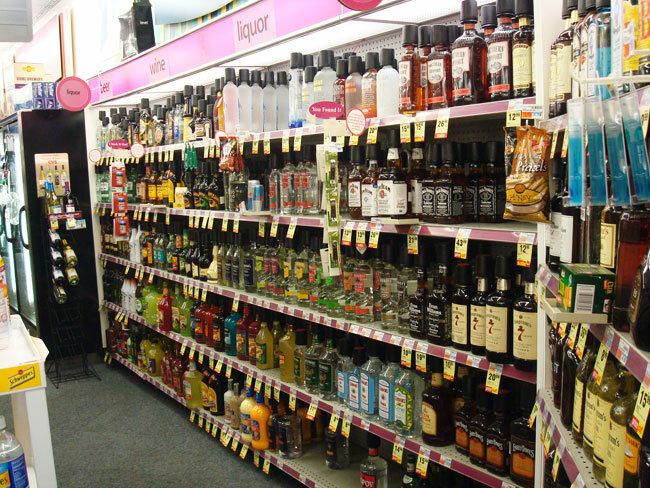 The first time I saw the liquor aisle at a CVS, my mind was blown. 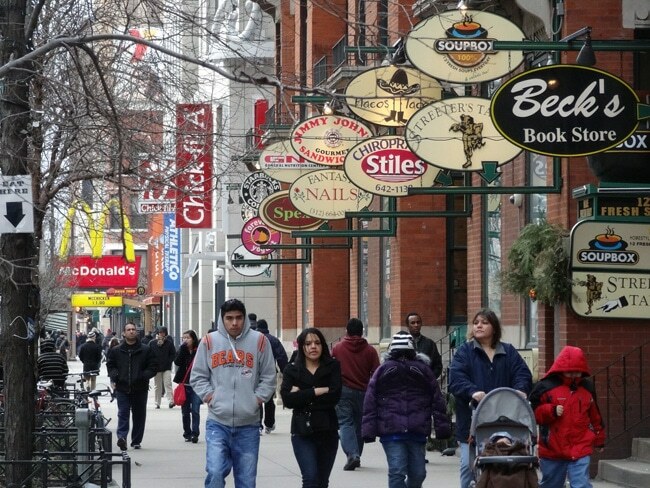 88) Just off Michigan Ave, the storefronts never end. 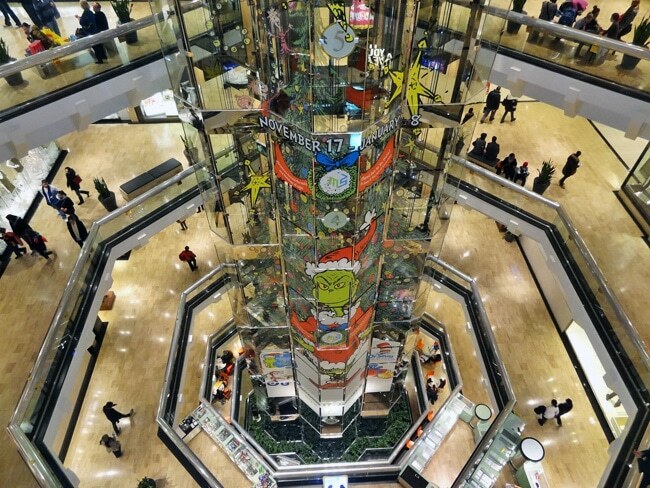 89) I prefer the view from inside Water Tower Place. Not as cool as Horton Plaza, but close. 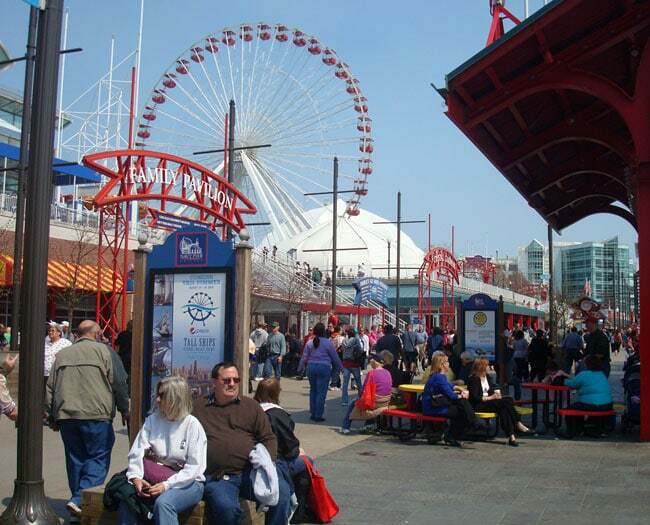 90) You could always head to Navy Pier. I’m not sure why you’d want to do this, but you could. 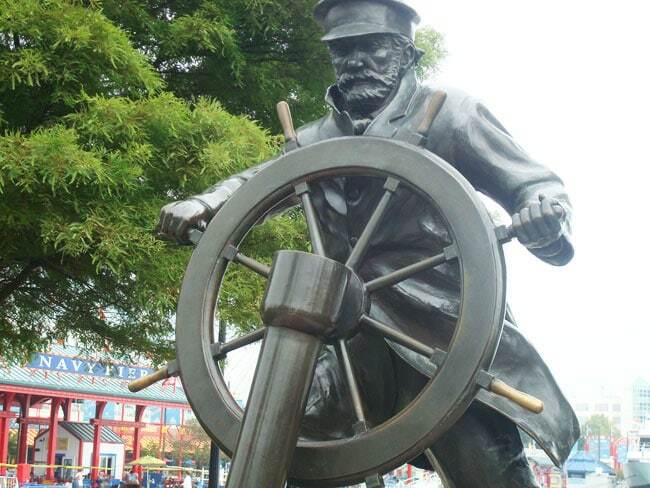 91) This guy is the best thing about Navy Pier. 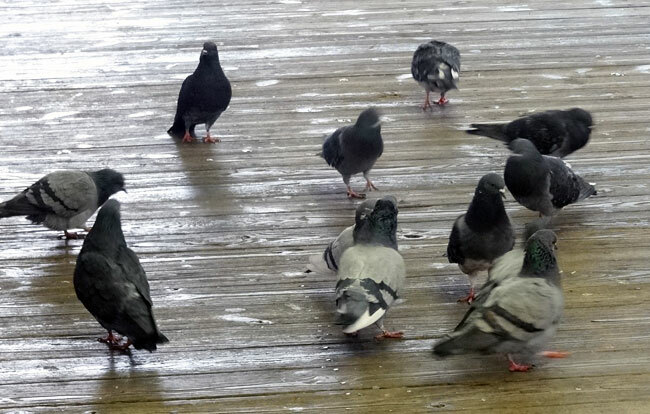 92) The pigeons are living large in Chicago. 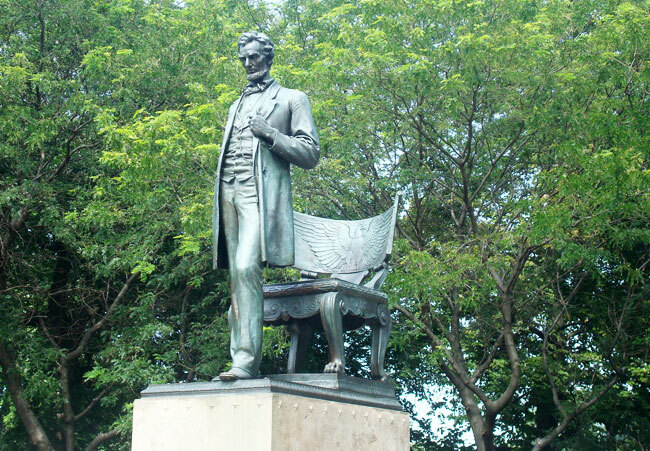 93) Of all the statues in Chicago, Honest Abe Lincoln might be my favorite. 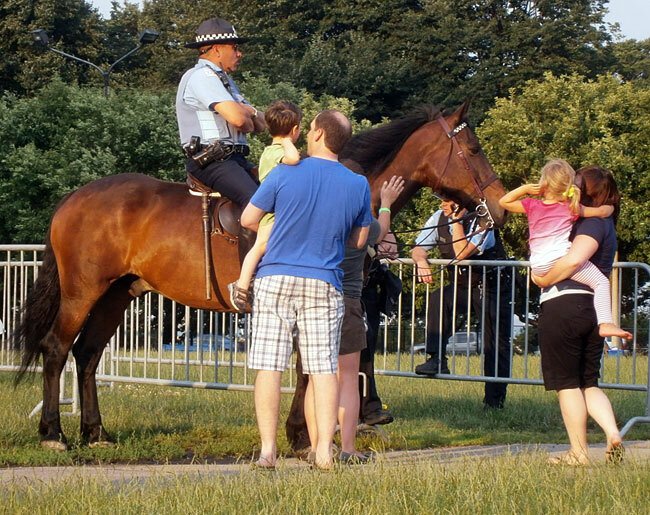 94) Sometimes the Chicago police go old school. 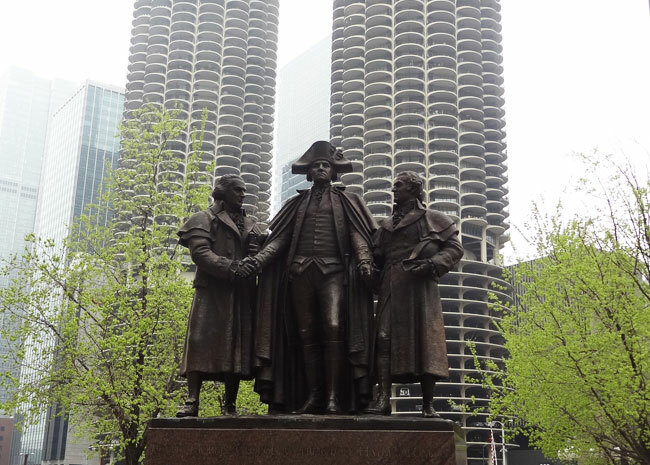 95) Robert Morris, George Washington and Haym Solomon stand in front of the Wilco towers. 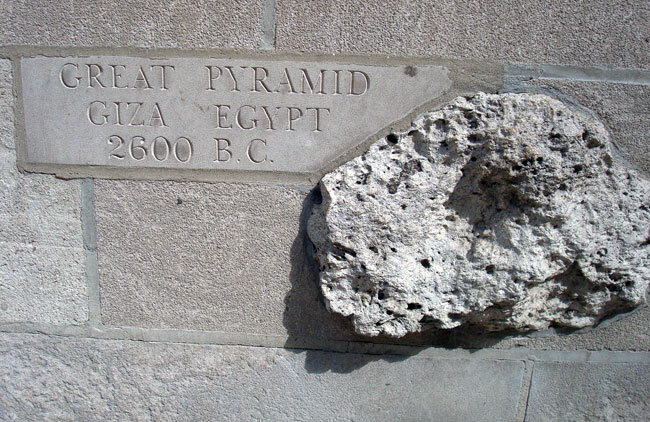 96) A chunk of ancient Egyptian pyramid embedded in the Tribune Tower. 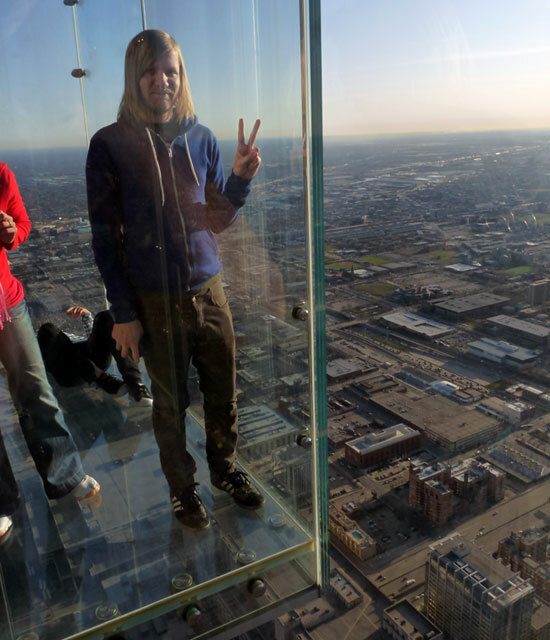 97) On top of the world (or at least the city) at the Willis Tower Skydeck. 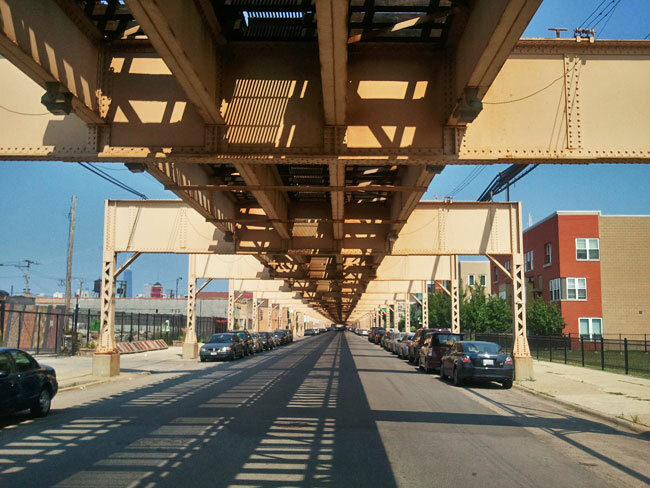 98) Those bridge-covered streets are kinda creepy. 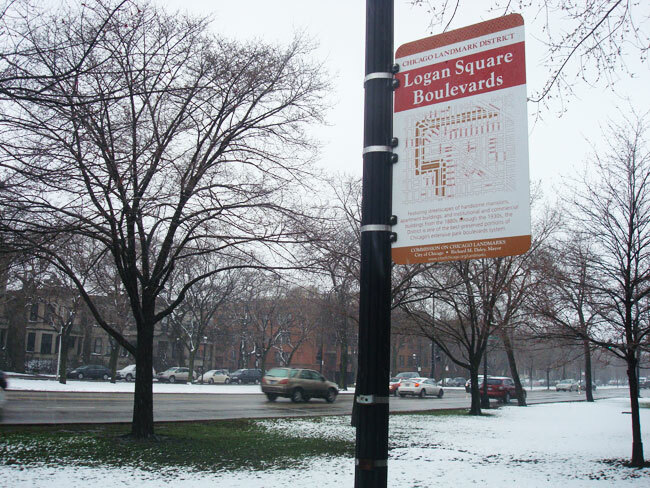 99) There’s a lot of cool stuff going on near the boulevards in Logan Square. 100) You can never have too much Bean!